words. — the first cut. I'm not terribly religious -- more spiritual, I suppose -- but it was fascinating to step into nexuses of history and faith while in Israel. From the silver star that marks the birth of Jesus in Bethlehem... to the Stations of the Cross en route to dreadful Golgotha... to the footprint in the floor of the Chapel of Ascension on top of the Mount of Olives. Something happened here. Maybe not quite the stories we heard in Sunday School. But something with the willpower to survive millennia. 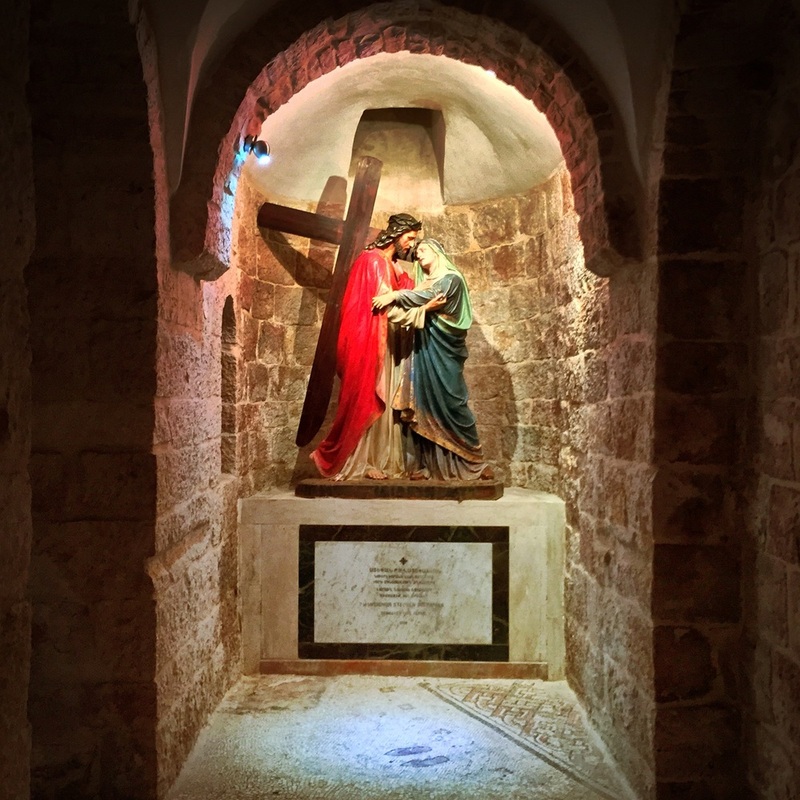 Alcove in the basement of the Church of the Nativity. Mary's footprints at the 4th Station of the Cross along Via Dolorosa. 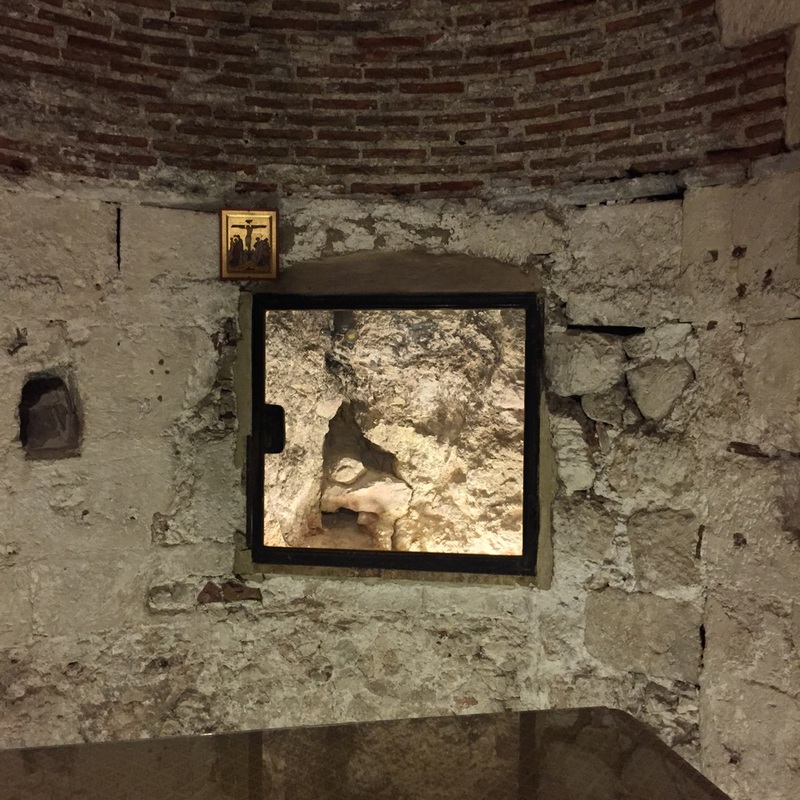 The rock of the Crucifixion in the Church of the Holy Sepulchre. The Chapel of Ascension atop the Mount of Olives. Words are not adequate vehicles to express the staggering magnificence of Petra, carved into the sandstone-rich Wadi Musa. It's difficult to believe human hands can improve on creation, but Petra -- resilient, enthralling Petra -- is proof that we are indeed capable of wonders. But rather than prattle on anymore about this most mystical place on our planet, here's a gallery of photos snapped on my two-day sojourn into the desert -- from that moment, that singular moment, when you spy the Treasury from the siq to the High Altar of Sacrifice that stands sentinel over Petra. And all the astonishments between, introduced to me by Issa, my wonderful bedouin guide. The Treasury AKA the Grail Temple from "Last Crusade." The Monastery, one of the three "high" places in Petra. The Treasury gets all the press, but the Monastery is the crown jewel of Petra. Overlooking the valley with my bedouin guide. The Altar of High Sacrifice. Worth the ascent. Tomb of the Roman Soldier, seen from within the Tricilium. Hiking the siq above the Treasury. Morning sun hitting the Treasury. Bedouin guide leading along the Roman colonnade. A most wonderful accident last night. I went to the Church of the Holy Sepulchre for one last look. Apparently I was so quiet, the priests operating the church didn't realize I was there... and they locked the door. Not just locked it, but barred it with a ladder. More on that detail shortly. Now, the church is administered by six different orders. Last night, it was the Greek Orthodox. Relations between the six factions are not always cordial, but the epoxy that keeps everything together are some very carefully architected and observed rules. Such as, the door cannot be re-opened once closed until the next order arrives. 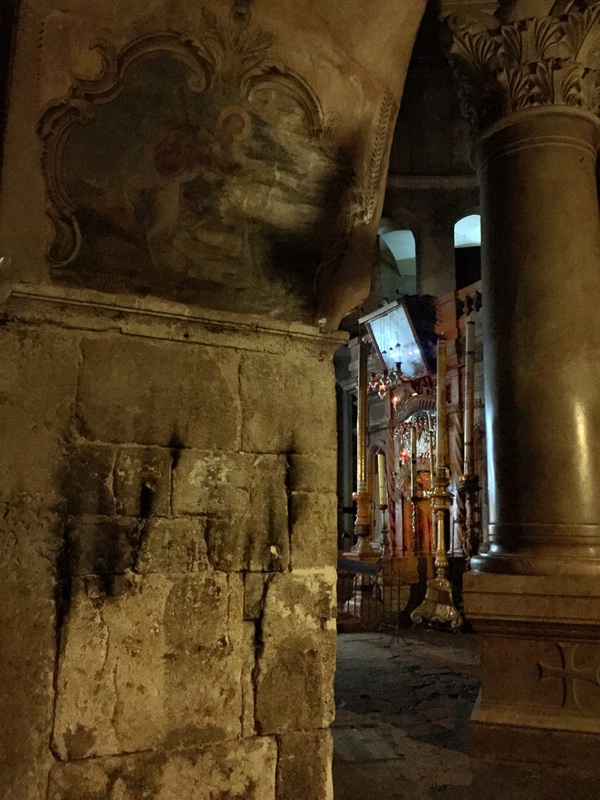 So, I was locked in the Church of the Holy Sepulchre for several hours during the night... and rather than be upset, I was appreciative. What an opportunity. No crowds. Just time to explore, admire, and reflect. And take a few photos. Getting out. Watching the shift change ceremony was incredible. The priest opened a smal window in the door and then passed the ladder through it. Once accepted by the next order, the door briefly opens. I slipped out into a quiet Old City and made my way through the Muslim Quarter in hopes the late night falafel stand was indeed truly a late night joint. Mercifully, it was. I sat and shared with a feral cat, still so pleased with an accident that may have cost me a little time, but resulted in something I'll never forget. Long way up to temptation. But the second, St. George's Monastery, in the Wadi Qelt was otherworldly. Founded in the sixth-century CE (and unfortunately destroyed), the monastery clings to the side of a valley -- allegedly the "valley of the shadow of death" in Psalm 23. The remains of the monks slaughtered in 614 CE are in the monastery chapel. I've seen no shortage of astounding places in Israel thus far, but this was something singular. Cut into the Wadi Qelt. Jericho. Come for the archeological wonders, stay to be chased out of them by a pack of wild dogs that seemingly rise from the ruins and stalk you like velociraptors before charging. They say don't run from wild dogs. Well, when that yellow one lunged I ran like hell. Hiked up the Mount of Olives, stopping in the Garden of Gethsemane along the way (where a very cool priest offered me a clipping from one of the olive trees -- not one of the 2,000-year-old olive trees but very cool all the same). The morning sun blazed behind me, throwing incredible light across the scape of Jerusalem's Old City below. From the viewing station, you can see everything from the Dome of the Rock to the Church of the Holy Sepulchre as well as posh hotels and cool museums, such as the very underrated Rockefeller Museum (which showcases lintels from the Crusader era Holy Sepulchre). I also ducked into the unassuming Chapel of the Ascension, where Jesus allegedly left this earth after the resurrection. The sun rises on Jerusalem from the Mount of Olives. Later in the day, walked along the Arab cemetery just below the Temple Mount to look back across at the Mount of Olives and the thousands of Jewish graves. It's said that when the day that ends all days arrives, those on the Mount of Olives will be among the first to ascend. In the valley below, there are massive graves misattributed to prophets -- these were likely very wealthy ancients that splurged for a front row seat to the last days. The number of shattered, desecrated graves on the Mount of Olives is horrific. Broken stones, overturned graves -- stomach-turning. A very sad reminder of just how contested this land is after all these millennia. And sets on the thousands of graves on the slopes of the mountain. hey now. portland. writing. games. wandering. cooking.